From Hollywood blvd to Sunset Boulevard, the Mexican Fan Palm (Washingtonia robusta) can be seen dotting the skyline. Originally from the canyons of Baja, Mexico, the Mexican Fan Palm has been a household symbol for glitz and glamour of Hollywood, California. 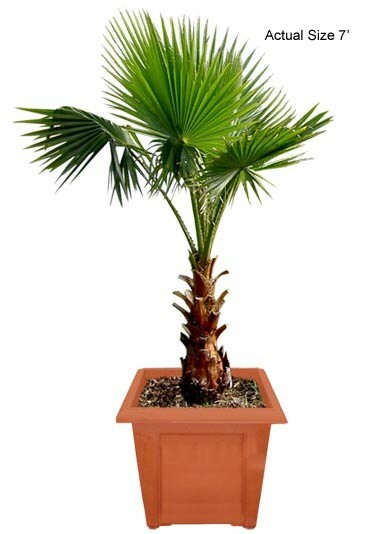 The cold hardy Mexican Fan Palm is rapid in growth usually growing to heights of 40 to 70 feet, but some can even be seen at heights of 100 feet. The Mexican Fan Palm has leaves which, when dried, dangle underneath the new leaves giving the look of fur on the trunk. Extremely adaptable to a wide range of soil types and microclimates, this cold hardy species have many fine attributes including very drought and salt tolerant once established and wind resistant. 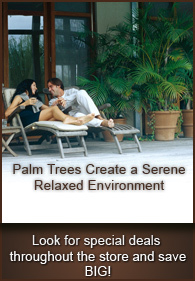 It is a spectacular inexpensive palm tree for landscaping large areas. If you want a piece of Hollywood, you have found it with the Mexican Fan Palm.